Sometimes, I hate admitting someone has a point. Especially when I still disagree in many ways with what they have actually said! However, I find myself in this situation. For the last 15 years or so, I have eschewed morale tests as much as possible although the pesky little buggers keep trying to insert themselves and periodically succeed. My beef with them is threefold, it is an extra step to be taken, it holds the combat results hostage and it is hard to design a simple test which is nuanced yet robust and reliable. Reliable in the sense that it will only rarely deliver unusual but reasonable outcomes and never unreasonable ones. When I decided to drop the previous Melee rules which resolved closer range shooting and charges in a 1 step process, I felt that I needed to add a morale test back in. The intent is that better troops are more likely to win or at least to put up and a hard fight and that troops which are poorly disciplined or which had taken a real pounding are liable to break and flee but that all troops are liable to be forced to retreat without being broken. As I continued to run test situations, it became clear that the new process was resulting in more stalemates and more panics than intended and fewer less drastic retreats and that the morale test too often worked against melee results with units taking a beating in melee and then rolling a 6 and standing while another unit that lost by a narrow margin and had every morale advantage, still rolled a 1 and retreated precipitously. On the surface there is nothing wrong with either of these two scenarios but the over all effect felt wrong. I began experimenting with various modifications to the morale test. At this point, issue 23 of Battlegames magazine arrived and as I was reading Neil Thomas's sample set of simple rules, a vague memory floated up of the previous issue where one of the problems he brought up was that of Double Jeopardy where a unit was rewarded or penalized twice for the same thing. Now at the time I disagreed with what he said and having finally dug out the article and re-read it, I still do disagree with his particular points to some degree (for instance Elite troops may be more effective in combat than Conscripts for reasons other than Morale so they may deserve bonuses in each for different reasons depending on how the rules are structured especially if they aren't multiple morale states). However, without having gone back to look at the details of his argument, the basic idea of double jeopardy had resurfaced and needed to be dealt with. My initial reaction was that, yes, I want Militia, for example, to be less likely to win the melee and if they lose I want them to be likely to break and run than disciplined troop so they should be penalized in both cases and having a separate morale test seems to be a route to achieve this. My second thought was well, what does the melee represent? According to what I've written in various versions, it represents both physical and psychological or morale factors. Oops! In effect the melee rule was using morale to help determine the winner and loser but the morale test was being used not only to determine the severity of the loss but was allowed to also overturn the earlier decision and accidently worked to ensure that good quality units nearly always fight until destroyed which was not the intent. Either the whole process needed to be re-examined and tweaked with possibly several different morale tests depending on the situation, or I needed to go back to my earlier one step process where I could more reliably tweak the process to get the result I wanted. I decided to do the latter which had worked well for nearly 7 years in various slightly tweaked versions. Some limited testing seems to confirm that it still works, with poor quality troops being more likely to lose than good ones but not guaranteed to, a unit of militia might beat the odds or an elite unit fumble. If they do lose, poor quality or badly battered troops will do so more severely but with a chance to rally. The system is not perfect but it is reasonably nuanced, its simple, its reliable and, its one step rather than two. An updated draft should be available by the end of the week. It seems that while I disagree with some points, Neil's discussion of rules and especially on double jeopardy has helped bring me back on track. Thank you Neil. I had hoped to get the troops out this weekend for a bit of practice but alas! renovations on the house have spilled over into my games room, submerging my table. Much of my time "off" therefore, has been devoted to rescuing it. On the bright side, by end of day my books will be much better organized. (even though a certain blog post has resulted in me ordering 3 Leonaur publishing books via Amazon.ca, "The Mounted Volunteer: A Diary of a Private of Missouri Mounted Volunteers on the Expedition to California, 1846" (just the thing for my Oregon War), "Three Cheers for the Queen-Lancers Charge! the Experiences of a Sergeant of 16th Queen's Lancers in Afghanistan, the Gwalior War, the First Sikh War ", and "Lady Sale's Afghanistan" - have wanted to read this since I first read Flashman. Looks like more shuffling will be required for the already most crowded section shortly). However, I have had time to digest some more thoughts and magazine articles, contemplate past games etc and do some minor field trials in a corner of the table. The results are both hopeful and annoying. Hopeful because they indicate that I am not far off the mark and that workable, successful rules solutions already exist in past versions and annoying because it appears that I have once again abandoned working solutions for less successful ones. I started by assessing the rules from a different angle than the player's enjoyment: "Do the rules encourage appropriate tactics and normally provide appropriate results". Since the rules had been designed to do this, I expected the answer to be yes. Now I only had 1 play tester but when rolling actual dice on the table top, I quickly found that the answer to both questions was "no". It was only after the fact that I realized that in doing so they also violated several of my own criteria for a successful game, in other words, in practice, they also worked against player enjoyment. The main culprit was the old bugbear, shooting and its sometime sidekick the morale test. How do you make medium range shooting useful without making it decisive, how do you encourage players to close when attacking, how do you (or should you) reflect some of the historical negative consequences of troops opening fire too soon, how do you capture, with simple rules, the point in a close range exchange of fire when one side gives way whether under orders or without and above all, how do you do all this in a way that makes the game challenging and interesting and capable of recreating historical situations? Well, my systems were simple enough I think, but other than that there were multiple problems. The worst sin, was that if you took a small battle like Chippewa, and just followed the original unit actions, the game might go as the original, if the dice fell right but it would take something like 20 turns to play, in most of which almost nothing would happen. For a battle which lasted 3 1/2 hours this is actually about right but as a game with 1/2 a dozen units aside including artillery, it won't be an exciting 3 hours! A little practical die rolling also showed that the dice would only rarely give the right result (it thus being possible rather than probable) and while the system could be tweaked, either the outcomes became too random and often wrong or the whole thing became even more boring and predictable. Oddly enough I have played the battle successfully as a game before, using an older versions of HofT. I believe that where I got into trouble was once again being fooled into working bottom up from details then trying to simplify and preach while maintaining scales instead of top down for effect. This is where MacDuff always went off the rails and I thought that was a lesson learned. The preaching bit refers to the assumption that if you can make the rules mirror tactical advice of the time, then players can be taught to do things "right". In practice most players are not going to be "into" the period enough and are not going to play enough to do that or care for that matter. It was gratifying at one Cold Wars game with lots of players unfamiliar with MacDuff, to see one player who was familiar with mid-19thC British tactics chasing off the various native levies before him while the other players struggled while carrying on a long distance firefight, in some cases with entrenched enemies, regardless of a prior briefing which warned them of the inadvisability of doing so. In the final analysis, this wasn't successful rules design. It made it possible for people who had the same concept as me of appropriate tactics to apply them successfully, but if didn't naturally result in either players picking up and applying those tactics or else taking the individual unit's tactical "how" out of the general's "where" and "when" decision to attack or defend. In effect, this comes back to who the game is being designed for, how big a typical game is and how long the game is expected to last before either being called or reaching a natural conclusion and what sorts of decisions players are expected to make. In practical terms, this means rolling back recent changes and going back to my old system, modified from Morschauser, where shooting (effective range if you will) wears an enemy down but "melee" (decisive combat whether close range shooting or charges) will result in both casualties and a forced retreat. The second issue to be addressed is that of army morale and again I will resurrect a past model which is to establish an allowable damage level per brigade and test for units to rout beyond this. I just need to settle the details. Now back to sorting books and clearing the table. The public perception of historical wargaming tends towards endless refights of famous battles as the wargamer strives to change history. Gettysburg and Waterloo being the most common for some reason (and yes, I've done both). But while this is a facet of the hobby, its not really where the roots of the modern hobby lie. What little we know of 19th Century Kriegspiels lean towards their being developed for studying/training contemporary warfare (for someone in the 1840's examining Napoleonic Warfare was still examining Modern Warfare). When we pass to HG Wells and Stevenson playing with Toy Soldiers, the games are still based on contemporary war, and the same is true of Captain Sach's game. I'm not sure exactly when the "Historical" part crept in. A casual observer might be forgiven for thinking that it sprang Athena like, fully formed from the foreheads of Don Featherstone and Joe Morschauser but both books report on a small but well developed hobby of miniature wargaming set in historical settings (mind you its easy to forget that in 1962 WWII was still a contemporary war, closer in time than the 1st Gulf War is now with WWII veterans still on active duty and weapons such as Bren Guns, T34's and Sherman tanks still in service). In any event, the idea of miniature wargaming as either a history based or fantasy/scifi based hobby is now commonly accepted. Just how historical those historical wargames are can vary pretty widely. Many wargamers will take part in refights of historical battles from time to time but most want the freedom to make their own choices and after all, even something as simple as the decision to allow d'Erlon to be committed at Quatre Bras slips from "history" to "alternate history" or "speculative history". In fact, while there are some gamers who only wargame specific historical battles and only deploy exactly the right regiments in the right uniforms, in the right postions, the vast majority of games whether historical scenarios, table top teasers, competetion games, campaigns or pick up games are "based on" and "inspired by" rather than "recreating" history and there is nothing wrong with either approach. Within that large tent of "inspired by" there has always been an element enjoying an additional touch of imagination which shows itself by the invention of fictional countries and wars. These can range from narrowly disguised historical campaigns to those who blur the line between history and science fiction or fantasy. There are those who raise an eyebrow at such frivolity but it goes right back to the roots of the hobby and Red Army vs Blue Army. For over a decade now, I have been intermittently working on a serious exploration of this frivolous aspect of the hobby. Somehow a collection of glossy Victorian toy soldiers just calls out for a setting less serious and exacting than only the recreation of actual past events. The question has been, should I make a serious attempt at alternate history, go whole hog and invent fictional lands and armies or settle somewhere in the middle. Having poked a tentative toe into each of these waters, they each have their own appeal and their own difficulties. Alternate History: The idea here would be to explore a real historical possibility, in my current context that would mean taking one or more serious war threats between the US and Britain in the middle of the 19thC, speculating on how and why they turned into actual conflicts then following through in a plausible manner. Investigating the actual history and finding plausible alternate events is a lot of work but interesting as one examines politics, economics and recorded historical deployments and contemporary wars. This only gives you a starting point though and as the campaign progresses, one soon loses all historical context for plausibility. That's not the problem. The problem is that serious alternate history is as limiting in its own way as actual history. By the end of the Aroostock "war" there were something like 40,000 men in arms in the Canada's, and perhaps 20,000 more in the Maritimes (the colonies of Nova Scotia and New Brunswick not being considered as part of Canada) in each case a mix of British regulars with volunteers and militia. Even given the wide geographic area and the need for garrisons etc,, still more than enough to allow for some decent wargame clashes and if there had of been a real war, that number of troops might have been doubled. If we go west however, it is unlikely that eiother side could have thrown 3,000 men into the Columbia District (Oregon Territory) and any battles for that half of the continent would likely have been skirmishes between a few hundred men at most. Fair enough, one can make an interesting wargame of such an encounter but the point is that there is no way to make a plausible alternate history campaign involving armies of 30,000 men maneuvering across Oregon in 1846. FICTION. So what about the "imagi-nation" or fictional contry route? I enjoyed creating Faraway and Oberhilse, dipping into fabricating history and dabbling in designing cultures as well as campaigns and I can see the attraction but while I was happy enough for one side to be completely invented, even if most uniforms were copied, on the other side the army was a thinly disguised British army and even that thin disguise was irksome at times. It was fun to field the New Dundas Highlanders but the urge to paint and field historical units never faded and it was hard at times not to turn supposedly fictional places into thinly veiled real ones. That's not necessarily wrong but it meant the solution wasn't perfect. Historical Fantasy. Here is a route that I haven't intentionally explored yet though looking back I can see that I have been there many times. What do I mean by historical fantasy? Simply wargame campaigns or battles between broadly historical armies but without any attempt at a plasuible setting and often incorporating implausible elements. 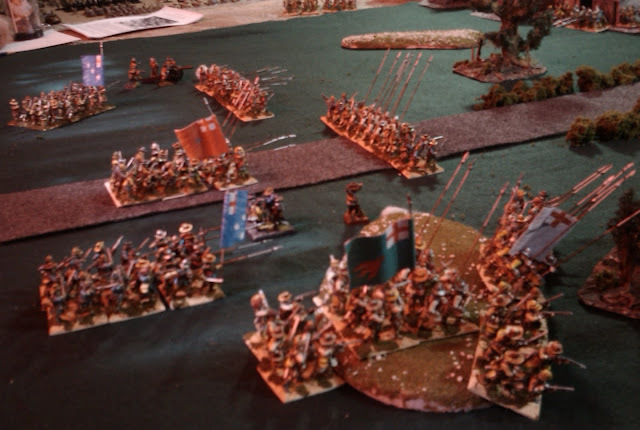 This was long common between ancient wargamers as they pitted say Alexander's pikemen against Caesar's legions but could also be seen in horse and musket games as a Russo-Anglo-Austrian alliance takes on a Franco-Spanish army or what have you. In effect, this is a thinly disguised traditional Red Army vs Blue Army wargame. On the surface it seems to solve all my issues as I can field what troops I want and give them a campaign setting without worrying about plausibility but while, in theory, I am in full favour of frivolity and escapism in an appropriate setting and even indulge in such behaviour occasionally, I fear that my imagination may not be up to the task and that the implausible bits will be a source of secret guilt! . The Wargame as Game: Part 2. Thanks to Jeff and Tony for their comments, my reply comment got long enough that I figured I'd just make it a post. Campaigns are definitely a good way to go. Having thought more about this, scenarios for le petit geurre usually have built in victory conditions so its mostly pitched battles or the typical, if historically rare, encounter wargame that the question applies to because the object is just to beat the enemy unless its part of a campaign or a scenario with set victory conditions (such as control of a road junction or the establishment of a bridgehead). a) 1 side has collapsed. In wargame terms some sort of division, corps or army morale failure or a preset limit in figures or units lost. Lacking these the game becomes b) by default. b) both sides are still capable of fighting at the end and the decision to stand or retreat is a calculated one by the general based partly on the condition and relative position of the 2 armies and partly on the strategic situation. In wargame terms a draw when time is up unless part of a campaign or having an arbitrary victory condition either in terms of losses or holding key roads etc. So in game terms, I am ok with leaving win/lose conditions to be part of the scenario design (even if it is just destroy the enemy's ability to fight) but I think there should also be the possibility of "army" collapse built into the rules. Right now my horse & musket rules have an optional rule forcing an army to give up if 1/2 of units are broken or destroyed but they used to have rules that allowed for a form of army collapse by means of morale tests and penalties as brigades got hammered. Seems to me now that I think about it that the 1/2 rule discourages reserves and I can't remember why it replaced the other. Needs some pondering. The Wargame as Game: Pastime and contest. One of the benefits of social interaction in general and the net in particular is exposure to ideas and discussions. Sometimes this cross fertilization is a distraction, other times irrelevant whether interesting or not, but sometimes its useful or even on occasion inspirational. I'm not sure where these thoughts lie in this spectrum yet. Now I definitely started wargaming as an amusement or pastime but I must confess to having indulged in a certain period when determining the winner was of high importance, including a few ancients tournaments, not many thankfully. The latter did result in a certain rush of victory after a tight game but the dismay and disgrace at the occasional defeat combined with deflation of a game with no challenge and the massive headaches after a long game led me to belief that this just wasn't what the hobby was supposed to be about for me. More over, even at the height of my brief competitive period, I didn't view the game as merely a "game" but as a wargame or battle and while making good use of the rules tried to design my armies in a rational, supportable basis using history as a guideline and tried to use tactics that felt reasonably historical to me. In other words, I never reached the depths (sic) of "anything legal goes". I especially delighted in occasional opportunities to defeat cheesy tactics and organizations by solidly based ones. That it was possible to do so indicates that the old WRG rules were sound at heart no matter how much they could be twisted if you tried. It was perhaps a reaction to the whole tournament thing that for the next few decades, I sought to minimize the winning/losing aspect of wargames. Instead, the success of the game was to be judged either by how well it recreated probable history or by the experience of the players, the trials overcome and so forth. Needless to say, the thrill of winning was not banished quite so easily and the instinct to win surfaced (and still does) periodically and naturally without need for either approval or encouragement. A few years ago, a friend who had dropped out of the miniatures side of the hobby for a few years, invited me to play a new game he had picked up called Axis & Allies. A hex map with off scale miniatures and wonky rules? Well, time spent with a friend is rarely wasted so I agreed but to my surprise I enjoyed the games we played. That was when I first started thinking about the wargame as "a game". d) Win-ability: People expect a game to have a point and they usually want to know if they won or lost. Perhaps it is the preponderance of solo games and unfinished social games over the last few years on top of my acquired distaste for "competiton games" that dulled my appreciation of the importance of this aspect of wargaming. The real question though is what, if anything, does it mean going forward? At the moment, I usually rely on scenario design to provide victory conditions of some sort, often with with a turn limit. Perhaps that is enough if the conditions are specific enough and the game can be played to a conclusion in the time available. Perhaps the subject needs more thought, especially around that crucial points of reaching a conclusion in the time available and being able to measure success, win, lose or draw..
Today was the first outing for my new ECW Scots army. I say new but while the army as such is new, most of the troops are not. The game saw an encounter between an allied army and Jeff's newly raised Royalist force backed by some of Gary's cavalry. We are still in the process of gearing up for an ECW campaign, testing rules and getting our feet wet. The rules in use today were Victory Without Quarter with a few off the cuff interpretations and house rules. The camera alas was my cellphone and the lighting was not optimal for its capabilities or mine. DunDubh Lancers: 2 stands trained lancers. Now a word of explanation is probably in order. The rules do not cover highlanders and rather than introduce a house rule before we were fully familiar, I suggested just running them as commanded shot. it over estimates the firepower of my archers but does make them more vulnerable to cavalry and to firefights since they only take 2 casualty markers and overall the effect was about right. The figures in this unit date back to about 1975 and my Valdurian army, later being incorporated in my 15th/16thC Scottish army, so I argued for veteran status and won my case. My other units were a mix of veteran troops with newly painted/sculpted figures who would have been green on their own but the mix brought them up to a believable trained status. Opposing the Scots were Jeff's Royalists with 7 green units of foot, each with 1 stand of pike and 2 of shot, and a field gun. George commanded Gary's cavalry wing with a regiment with 2 squadrons of trained horse (gallopers), a single squadron regiment and a light gun. Supporting the Scots (well its MY battle report) was a Parliamentary force under Martin with more of Gary's troops, 1 squadron of raw horse (trotters), a light gun and 5 or 6 regiments of raw foot, each 1 pike and 2 shot, all, it was hard to see them through the hedge and village and all that smoke. The battle plan for the allied army as far as I understood it, was for my English allies to advance and seize the town while pinning the enemy in place and wearing him down. My veteran and regular troops were to advance and sweep away twice their numbers of green troops. On seeing all of the King's cavalry lined up against my flank, my instinct was to hold back my lancers but instead I sent forward the clansmen and the lancers to seize a little hillock, hoping that it would help offset his numerical advantage. Unfortunately, I allowed the lancers to ride ahead and George humbugged me by bringing forward a gun that I hadn't seen. While this was going on, the Parliamentary cavalry had crossed over the hedge and attempted to win a firefight with the Royalist infantry. George sent a squadron to charge them in the flank and we looked in vain for rules on flank charges. We ended up deciding that George did not need to pass a morale check to charge and that Martin had to take the charge at the halt without firing but could turn to face. 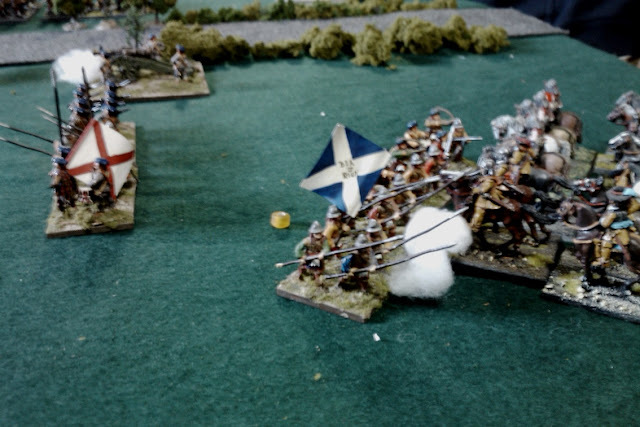 The result was no surprise and in short order the trotters were dispersed, leaving the Royalist gallopers in range of my newly sculpted and cast Scots infantry and in medium range of my gun (crewed by the same castings, slightly modified) . Moments later the broken remnants of George's horse galloped back to safety where they rallied and lurked for a bit. This left the way open for my clansman to advance and wipe out the light gun. Things were looking up on the Scots side of the hedge! Across the hedge, a ding dong firefight between the two forces of green infantry initially seemed to go in the King's favour as the Royal troops held back, relying on artillery and long range musket fire to panic the enemy's raw troops. Due to the hedges, the opposing infantry ended up in column fighting for control of the road, again we had to make some quick calls as the situation didn't seem to be covered and the rules over what a column could or couldn't do weren't clear. A drunken master gunner unfortunately took off with the Parliamentary gun (event card) but eventually their infantry started hitting back and neither side managed a decisive advantage. 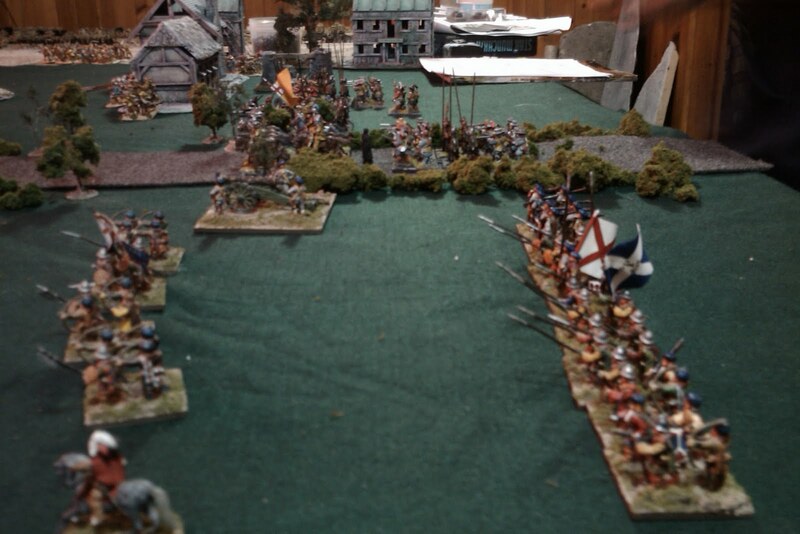 Back on the Scots side of the hedge, I tried to regoup as George's various squadrons rallied and began to threaten me from front and rear and Jeff's infantry started working their way forward past the wood. My infantry with their sole stand of muskets, just didn't have the oomph to inflict serious damage on the enemy but the cards gave me the best chance they could have with a close range volley, 3 dice needing 3 or better to hit but needing all 3 hits to have any effect. 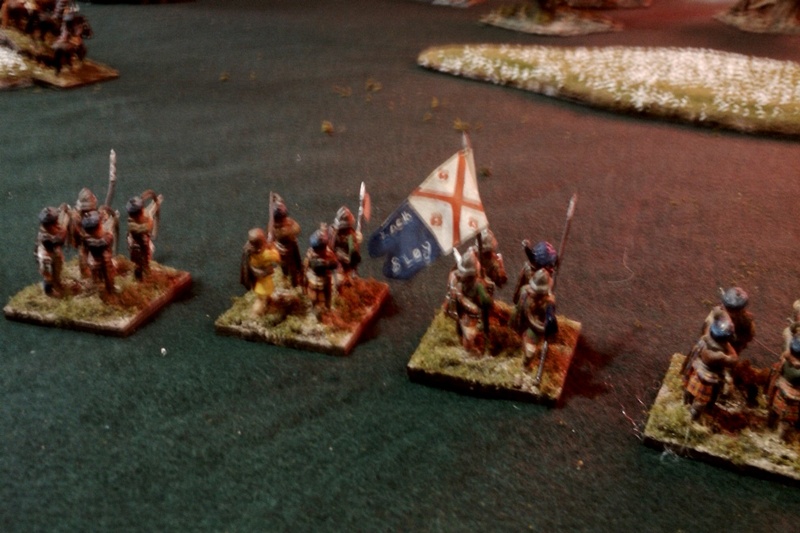 My musketeers were converted pikemen mixed with archers and they just didn't manage it. 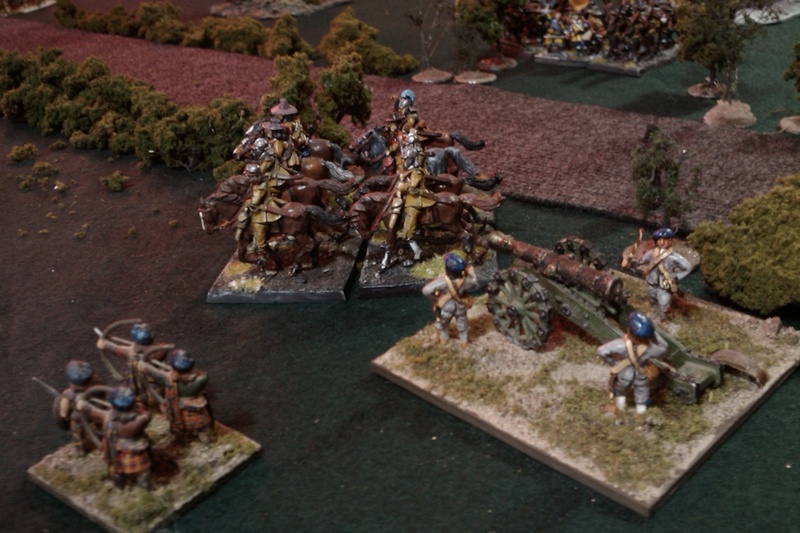 They did manage to get in between the enemy cavalry and the rear of my artillery. Steady pikes, I figured they had a good chance of holding but it seems they lacked confidence in their newly painted Colonel and no pride in their new colours as they failed to either hit in melee, or to pass morale and soon George's troopers were pressing forward and into the rear of the new battalion of the Strathcona's. These, despite ample chances to form a pikestand, were still in line facing forward to protect the gun. Undeterred by the rear charge, they fought the cavalry to a standstill and turned around. The 2nd squadron of cavalry charged in and the Strathcona's pushed them all back. The rallied single squadron of Royalists spurred forward, over ran the gun but couldn't quite reach the rear of my infantry. Like a deus ex-machina, a stand of Parlimentary foot appeared in a break in the hedge and blew them to bits! The Strathcona's proceeded to rout the enemy cavalry, one squadron after another! One last drama remained, the Macfarlanes, Earl Ross at their head, pressed forward, 2 veteran stands against 6 stands of raw enemy troops. They unleashed a devastating volley into the White regiment and then charged, routing them. As they shepherded the enemy across the field, they wheeled to face the Green regiment but bolstered by Jeff's personal figure, these held firm despite casualties and in the ensuing firefight, the Macfarlanes were effectively wiped out. Earl Ross fell back and ordered the Strathcona's to cover the retreat of the various wounded and stragglers as they limped from the field. Darkness was coming on a pace and with 1/2 the Royalist army routed, the two English armies agreed to call it a day. A while ago I showed the dolly for a new unit of home made 25mm ECW Scots. The original 2 figures based on the dolly somehow grew into 30mm figures so with a game scheduled for Saturday, I tried again. So one general purpose open handed figure in OS style. The hands and face in particular need work and the sword isn't coming out of the mold yet but I'm pretty happy with them. Three variations on the basic figure once cast up. Others have become artillerymen. The Zinnbrigade artillery molds are amongst the most useful molds I ever bought. L to R Governor General's Bodyguard dismounted, US Artillerymen, Bengal Horse Artillery, 1812 Michigan Volunteer Artillery, Original 1900 Prussian artilleryman figure painted as Schleswig-Holstein. US Mountain Howitzer and 40mm crew. Yes I know, it should be broken down and loaded on to 3 mules not 1 horse but this is a working toy not a model. The gun itself was cut down from a Prince August 12 pounder with carriage from a Historifigs ACW gun and wheels from a PA limber. Crew and pack horse converted from Zinnbrigade 1900 Prussians and my own 1840's officer. After last weekend's game, I started looking at what troops I had already painted and what troops and scenery I would need for my proposed 1837 campaign. The first thing I noted is that almost all the troops I have on either side are dressed in hot weather gear. I could argue that Havelocks are not out of place in New Brunswick in the summer but if I want to recreate the Lower Canadian Rebellion, I need troops in greatcoats and Patriotes in capotes and the 3 don't mix. I also got to thinking about all those trees that have been leafless since I first painted them for my 54mm version of the October Battle of Chateauguay 12 !!! years ago, and the fact that a proper rebellion game needs leafless fall and winter trees. I seem to be working against myself here. Then I thought about the other half of this project's original name: Aroostock to Oregon, the Oregon side that had captured my fancy and been transferred to the fictional setting of Oberhilse and Faraway. So, I started googling again and looking at maps and time frames and speculation about what might have happened in Palmerston had been Foreign Secretary in 1845/56 when Polk was rattling a saber and proclaiming "Fifty-Four Forty or Fight! As for my Lower Canadian Rebellion, I think the Game in a Box idea is going to the best after all. All I would need is some fall and winter terrain, about 24 British regulars in great coats and Bell Shako's along with another dozen or so in their red coatees and a gun and crew. If I ever get around to the 1st Afghan War, and I do hope to, these will come in handy. For opposition, 60 Patriotes in capotes will do and the better armed can also serve as 1812 Sedentary Militia or HBC volunteers out west. So what does the Oregon War start to look like? Small armies, wide plains, high mountains, rivers, a few small settlements, wooden stockades, long supply lines, fleets (well, small squadrons) off the coast. So far so good. On one side, US regulars and volunteers following the Oregon Trail across the continent, marines landed from the Pacific Fleet, volunteers raised from the new settlers and maybe some California rebels. Basically a Mexican American War American Army. On the other side, British regulars brought across the Pacific from India with some Irregular lancers and eventually perhaps, Sepoys in support, and of course Royal Marines. Hudson's Bay Company volunteers, Metis, Courers des Bois and immigrant Scots, reinforcements from Britain brought in through Hudson's Bay and down the Red River, Highlanders in feather bonnets and Guards in bearskins, Riflemen, traditional toy soldier stuff and why not some Cree, Blackfoot or other Native American allies? Lots of scope for steamboats and I have that nice balloon. A military railroad perhaps? Unlikely but possible. As long as I'm not being serious, its 20 years after Gurney's Steam Carriage outraged the Luddites, it might be more welcome in Oregon. Perhaps some early VSF might be a switch from years of seriousness. Who knows?. With painting already under way, its a good sign. Manifest Destiny? This is as subjective a matter as one can imagine but more and more I find myself drawing away from contrived solutions to wargame design and towards "natural" ones. In essence it comes down to the difference between a mechanism that eventually gives the right result with one that has the right feel. Of course, ideally you want one that does both. Since instinct and expectation are linked to past experience and knowledge it is not possible to determine definitive intuitive solutions but by observing the reactions of gamers at conventions and club games and listening to my inner voice, I have found a few trends. Some of these are the result of past experience of rules but others come from our understanding of how the world works and are the sorts of things new gamers expect even if they have never played a wargame before. Here are a few that I have decided were worth trying to incorporate. a) Immediacy. Things seem to make more sense when results follow directly from causes and can be linked visually. Perhaps I should say that they make more sense emotionally. b) Reciprocity. People like to fight back when attacked. You would think that following these concepts would make game design easier, after all, they are what you get if 2 kids sit down to play. (Bang, you're dead) Trying to recreate complex historical processes with a simple game is often easier though if using abstract mechanisms. a) Theory: does it encourage tactics which I think are appropriate? b) Feel: does it feel right? c) Practice: is it going to make the game more interesting or less? How did various mechanisms fare? a) Rallying and casualty recovery. I like units to be able to take a pounding but be able to fallback, rally and return to the fray if given breathing space. My preferred method of doing this has been to allow the recovery of some casualties and I tried to re-introduce it. It works in Theory if balanced right, fails Feel miserably despite whatever theory I might spout as people don't see casualties as "disruption points" or similar, they see them as dead and wounded guys and while willing to welcome them back if it helps win and understanding intellectually what the process is, there is still the feel of guys coming back from the dead. Finally, since the process almost inevitably makes it harder to get a decisive result, it fails in Practice. I resorted to a simple morale test. b) Sequence of play. People understand taking turns well enough but the rules of immediacy, reciprocity and visibility apply at an instinctive level. People can be easily taught to play in phases but it is very common, for example, for new gamers especially to want to shoot back right away when shot at. I had moved away from the card sequencing of play but have come back full force with no separate fire, melee or movement phases. I noticed though that it just didn't feel right when two lines faced each other and one blazed away while the other waited patiently. It was even worse if the firing side went 2nd that turn and 1st next turn getting in 2 shots without reply. I already had both sides fighting in melee which could represent close range fir so the natural answer was just to allow units to shoot back but that violates our expectations from past wargames and raises questions such as how many times a unit should be able to fire and so forth, In theory its not really a problem since we aren't tracking every actual round, just the mutual effect, Reluctantly, I tried it and to my surprise it worked fine, feels natural and helps speed the game to a conclusion. c) Melee. This is one of those annoying areas where a simple, effective but abstract rule bothers people enough that it bothers me. From Morschauser I had borrowed the 3" melee distance idea. To me the shooting was stand off firefights, historically indecisive and so in game terms as well with only 1 side firing and low 'to hit' scores. Melees were decisive firefights as well as charges and were so in the game with both sides fighting and one side being forced to retire if not destroyed outright.. Works in practice and in theory but it just doesn't feel right when your cavalry hovers 3" away from their target and rolls for hits, It is also disappointing to be unable to differentiate between a bayonet charge and a close range volley. In theory, as the General, we shouldn't care but especially in a small game, such narratives become important. I found myself adding rules to differentiate, to penalize shock troops not in contact etc. Complications. Once I had added firing as a reaction and added a morale test, it suddenly got easier, Now close range firefights were two way and the possibility existed of forcing the enemy to retreat by fire. For those troops with the nerve to brave the enemy's fire their assault with bayonet was more likely to force a retreat. It appears to meet all 3 criteria. d) Morale tests. I have a love-hate thing about morale tests. The Brigadier with experience of both real and play war urged us to not bother with complex morale rules and the Canadian Army agreed when they wrote their own wargaming rules for training. Morale tests have been there since my first exposure though and they can be the easiest way to get intermediate results between standing and breaking. The trick is to prevent them from being too complex, too frequent or too random. No one likes to have their elite guards run away without a valid reason. I had added and removed morale tests various times and started this round with a simple one and the premise that a test should only be taken in severe situations. It didn't take long for the test to be replaced by a more complex one with more levels of results which could be taken for minor reasons as well. It lasted for 2 turns before odd things happened and it started bogging then game down. The simple one returned and so far seems to do its job, if your unit is in a world of hurt it might run away, but only of it has a reason and it might not at all. Not perfect but it seems to meet the criteria. c) the magic ingredient: 40mm toy style figures that are light enough that a magnet will hold them! Magnets and some form of movement tray were an obvious solution but most of my 40mm figures are large and clunky and early experiments failed miserably with figures toppling at the slightest tilt. (I know that more powerful magnets must exist if I looked hard enough and paid enough but I'm into cheap and easy). Fixed element on left vs new temporary element on the right. Note angle of dangle. They will usually hold even perpendicular to the ground as long as you hold the base not the figures. Sash & Saber and Trident start falling off at about 30 degrees even though mounted on the same washers. 4 man stands vs 8 man ones: More fiddling to move a unit but experience tells me 4 out of 5 games won't bother to turn more than a few figures on the end when they go into march column! At the moment, my rules are unit based rather than individual based or element based but I'm happy that I can proceed with basing and handle all 3 rule concepts without further basing, The best of all worlds? d) Get a feel for what terrain I need to fix/create for a campaign such as was being contemplated. e) Get a feel for how well the currently proposed version of the 1840's project fits what I'm looking for. The table from behind American lines on or about turn 3 or 4. Lets start with terrain. One deficit that has been bothering me for years but which I have put off until I had a permanent games room again, is trees. If you are going to play 18th/19thC games set in Eastern North America, one thing you need are trees! The other thing is fences. This is a dual problem. You need them for atmosphere as well as for tactical & operational impact but they get in the way of the wargamer as much as they got in the way of historical commanders. When you look closer, the tactical effect isn't what you expect, the armies usually sought out clearings to fight in. In Canada at least, settlement tended to follow the rivers and thus you get a typical situation where there is a major river on one flank and "the forest" on the other, the battlefield becomes long and narrow. Quebec, Crysler's Farm, Chippewa, all fall into this broad category. The battlefield itself was often crossed by various streams, gullies and fences. In many areas, small woodlots and lines of trees and bushes can be found along the fence lines and in corners of poor land. All in all not fun terrain for a real life general to attack over. This pattern is gone in many areas but it still exists around where I live and indeed, my house was built 5-10 years after the purported battle was fought. So I decided to layout a terrain of this sort which would have been typical for an 1840ish Anglo-American war. 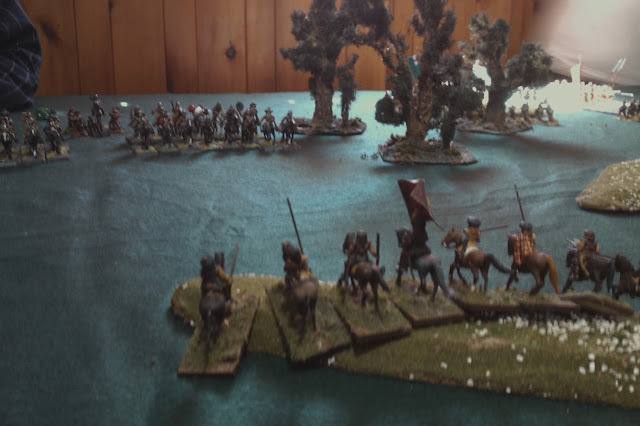 The river side is good and easy, the wood side is a problem as the players have to lean over tall trees to reach their troops, (with 40mm troops I find 6" - 8" trees small but acceptable, 10"-12" are better) but if you leave off the trees, the atmosphere is lost. If you turn the game so that the river and forest each run along a short side, you also lose the perspective of the long narrow field which restricts deployment. Setting to with a will, I laid out hills, farms with veggie gardens, fields of crops, hayfields and pastures, fence lines and hedges, patches of woods, the edge of the forest and one straggling dirt road. Even though much if the scenery was crude and unfinished, the over all affect was quite pleasing to me. Then I laid out some troops. Hmmm. It didn't take long to for a problem to emerge, there was no room to maneuver and few tactical options. For a skirmish with a handful of indians and rangers, it would work but it would make for a tedious, predictable and boring game. Hauling out some favorite authors from the 60's I reread their various comments on scenery, looked at the table again and removed at least 1/2 of what I had laid down. The result was still a crowded, tactically difficult battlefield but one with at least a few options and some interesting problems for both sides. Anyway, something to think about as I am planning this project but luckily as I continue to move towards the glossy toy soldier look, simple toy like scenery gets more and more fitting..
Their mission was to prevent the Americans from controlling the road which exits heading North-East by nightfall (turn 20). The rail fences were deemed too insubstantial to delay movement or provide cover from fire but would count as an obstacle to an attacker in melee. The British deployed first. After some thought, they left the 2 battalions of Elite infantry along the road over the bridge as a reserve, placed the Canadian regulars and artillery along the hill and fence line 1/2 way up the valley and the light troops as a screen along the first line of hills with the Indians in the forest. All units were deemed hidden from the Americans, either in dead ground or concealed except for the Victoria Rifles and York Volunteers whose outposts could be seen. The Americans had 5 battalions of regular infantry, 2 battalions of militia, 12 regular light infantry, 12 Militia riflemen, a light gun and a battery of foot artillery as above. They also had a squadron of 8 New York Dragoons who they opted to risk on a wide flank march. They diced to see if they had reconnoitered the enemy position and deployed or if they had to march on in column on the single east-west road. The Americans outnumbered the British & Canadians about 2:1 but while the British had several Elite units and plenty of defensive positions, the Americans had several militia units and a constricted front that would not allow them full use of their numerical superiority. They could send an outflanking force, rolling 2 dice for turn of arrival if only cavalry, 3 dice if including infantry, 4 if including artillery. The elected to send the militia brigade up the left to draw the enemy's attention and try to pin him, The 1st brigade composed of 3 regular battalions and the light infantry were to attack along the front with the light infantry moving up through the woods to protect the flank. The last brigade of 2 battalions and the light gun was to be held in column reserve to exploit and openings while the battery did its best to find a field of fire on the left center. On the American right, the light infantry could make no headway against the Indians and had to call for help. A battalion in attack column was diverted into the woods and together with the light infantry, began to slowly push the Indians back. On the left, the American riflemen lived up to their reputation and were soon supported by artillery firing from height to height. The Victoria Rifles on the other hand, couldn't seem to find the range and the Brigadier rode up to order them to pull back. Too late! He was struck down as the Rifles fell to 50% and broke to the rear. In the center, the American Infantry slowed down their advance to trade fire with the York Volunteers. These were forced to pull back to avoid being flanked as the Pennsylvania, King of Prussia Volunteers (a well trained unit wearing Prussian inspired spiked helmets....) from the reserve brigade pushed up the road on one flank and the Victoria Rifles fell back on the other. The American line struggled forward over fences and through some small thickets only to come under heavy artillery fire. With an eye to the clock, the Americans resorted to bayonet charges. This put the York Volunteers in a tight spot as the battery which was being withdrawn would be exposed if they evaded. Their Colonel had just taken over control of the Brigade and inspired by him they held. The US 2nd Infantry crashed into them, the volunteers rolled 2 dice for 5's and got 2 hits, it was a tie! In the 2nd round they managed 1 hit, 2nd infantry, rolling 3 dice for 4's whiffed and were repulsed. As the Pennsylvanians pressed on up the road, deployed into line and opened up, the York lads fell back from position to position until finally the remnants regrouped in the Stone House. While all this was going on, the 2nd New York Dragoons had arrived promptly on turn 5, galloped across the bridge on the last card of the turn and deployed into line with their horses breathing down the flank of the Young Buffs. (they rolled something like 23" on 5 dice for their move on board.) There was a tense moment while the cards were shuffled but the British won and a red card appeared, allowing the 31st Foot to calmly redeploy to face the cavalry. Being small unit of light cavalry, these wisely used their mobility and discretion to nip out of the way and maintain themselves as a threat in being and a constant thorn in the side of the British. In retrospect, it might have been worth their while for the 2 reserve units to try to corner and drive off the handful of dragoons rather than letting them be while keeping a wary eye on them. On the main battle position, the Fencibles braced themselves for the onslaught of the enemy militia. These were supposed to be a diversion but with the rout of the Victoria Rifles, all that was forgotten and they pushed ahead full speed. The advancing riflemen maintained the deadliness of their fire and then the Maine & Ohio militia battalions pushed through to the front and started trading volleys with their counterparts. The British commander ordered the line to fall back but the Fencibes were badly cut up. The American militia followed up and suddenly the Fencibles, broke and headed to the rear to rally near the church, a spent force. The 41st suffered less and was able to pull back in good order. A tremendous firefight ensued as at last the regulars met. Despite the cover of the stone wall, the odds were too great and at last the 41st Incorporated Battalion fell back and then broke. The Pennsylvanians attempted to storm the Stone House but were repulsed, On the inland flank, the Indians had been slowly pushed out of the forest and onto the Stone House Hill, if they retreated any farther, they would expose the battery and have to face the American Dragoons in the open. The US 1st Infantry lowered bayonets and reduced by half, the warriors broke and headed for the forest. 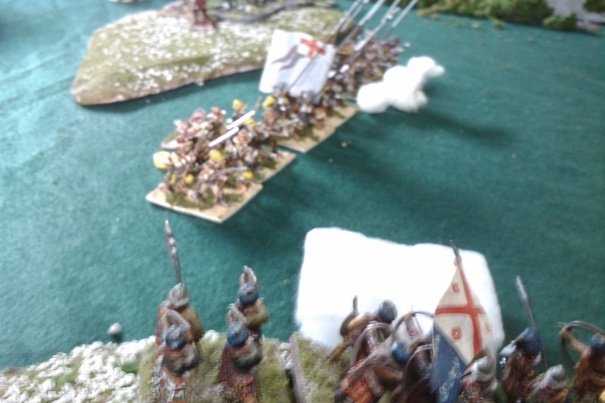 Carrying on their assault the infantry was momentarily halted by cannister but then pushed on and took the guns. 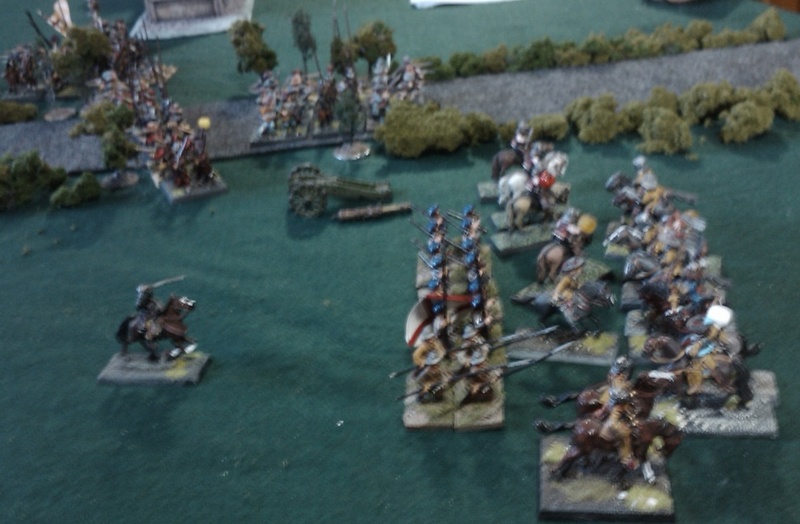 There were 4 turns left but the game was up with the Dragoons across the road in touch with the 1st Infantry and the odds now looking at about 4:1. A small detachment of the 31st still held the Acadian House by the church and if the remnants of the York Volunteers and the 49th hurried, they might still be able to retreat past it and make their way up river. A fine army had been shattered and the road to Brooklyn lay open. The 31st Foot prepares for action as yet another test game begins. HUZZAH ! The tropical weather has gone, Hurricane Earl failed his morale, broke up and blew by with only a few ripples and life is slowly getting back to normal. Normal of course means frigging with rules, unit sizes and basing. This is not a new pastime for me but the last 5 years have been particularly intense as I try to sort out exactly what my 1812 to 1850's 40mm armies should look like and what sort of games they should be organized for. In particular what I felt ought to be best and what seemed to work best in practice have seemed at odds and taken quite a bit of balancing and investigating. Various "clever" ideas have also complicated things and I have been up and back various roads, some several times, more old school, more new school, more skirmishy, more tactical, more battle-y, more abstract. But at last various trends seem to be well defined and I have what I think is the right sort of organization and the right set of rules. There are strong echoes of With MacDuff to the Frontier and the structure behind Morschauser Meets MacDuff can still be traced but they also hearken back to my old Horse & Musket rules form the '80's. I've also spent a fair amount of time with several Don Featherstone books this summer and the philosophy if not many particulars have had their influence renewed. Lawford & Young's influence is inescapable and I came close to just adopting Charge! for this project. Last but not least I have also been re-reading my 35+ year old copy of Little Wars. Time and space have also had their influence, one can only fit so many 40mm troops on a 6x8 table and still have room to maneuver. I have a sentimental attachment to Charge! style units with 3 or 4 largish companies but in practice, the individual companies tend to confuse players if also given multiple regiments and require that they build their units to my specifications. (and I expect most potential players to be unfamiliar with both troops and terrain and to have their own preferred organization). Some measuring and experimentation has also confirmed that a unit foot print of between 8 and 12 inches is ideal for playing Table Top Teasers as well as historical War of 1812 actions. 5x4 man Morschauser regiments also have a very strong emotional pull but while I have retained 4 as the basic group for combat, unlike the original, 1 such group is too small to be practical with what I had in mind. So, at last, after severe trials of 2 alternatives, I have bowed to the inevitable and adopted the 3 x 8 organization that has served me well in my 1812 US organization. The 8's have no significance other than each will get their own movement tray but also each "company" of 8 will get an officer and an nco. Cavalry and light infantry will be formed 12 strong. Artillery will be 2 guns with 6 or 8 gunners. The next post will include a brief look at today's test game and a few comments on the rules and why they are as they are. For those interested in a copy, they can be had from google docs here. Or drop me an email and I'll send you one. Its not quite a final edition, even if I don't find any more loopholes, conflicts and ommissions or get any irrisistable bright ideas, as I want to add some examples of play, diagrams, sample orders of battle and so forth.